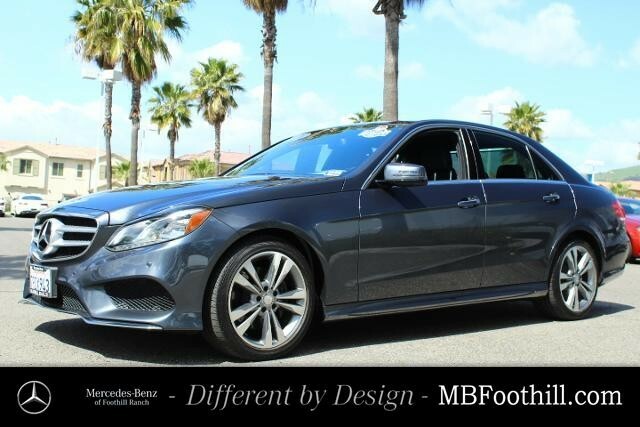 Mercedes-Benz of Foothill Ranch is offering you this Certified 2016 Mercedes-Benz E 350 Sedan at a competitive price and welcomes you into our world-class dealership to test drive the vehicle of your dreams and experience the very best in selection and service. Original MSRP priced at $61,340!. Sculpted in Steel Grey Metallic, our 2016 Mercedes-Benz E 350 Sedan is the epitome of driving perfection! Powered by an advanced 3.5 Liter V6 that offers 302hp while tethered to a paddle-shifted 7 Speed Automatic transmission. This stellar Rear Wheel Drive machine boasts agile suspension and offers a ride that redefines luxury while scoring near 30mpg on the open road! Our E-Series has been masterfully crafted with a power sunroof, beautiful hand-polished wood trim, and 14-way power adjustable front seats with memory. Our technology is easy to use and our COMAND®®® system with a central controller makes operation second nature. If you are seeking an extra touch of luxury, you have chosen well. E-Class quality runs generations deep and you will appreciate the value when you first settle in!